A press conference took place in South Korea’s capital city Seoul, which will host matches in the group. The group features defending Premier12 champions South Korea, Cuba, Australia and Canada. 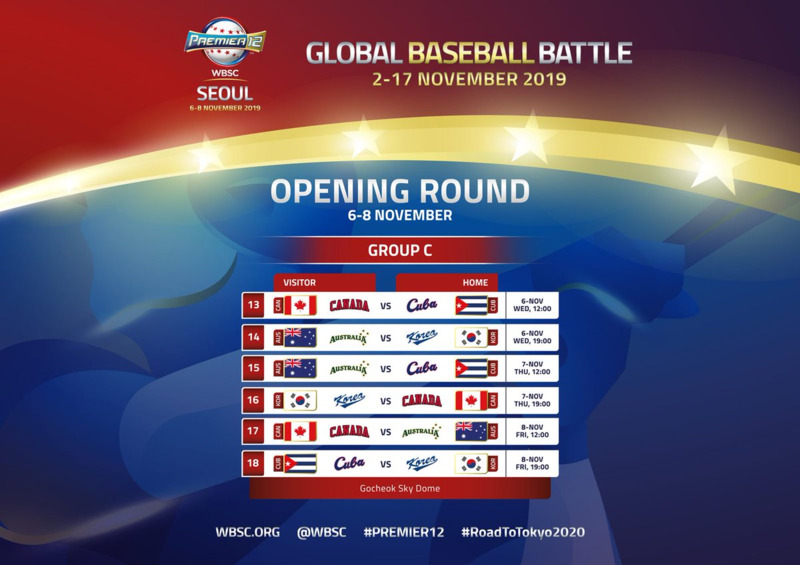 The opening match at the 16,813-seat Gocheok Sky Dome is due to see Cuba face Canada on November 6, with Australia debuting at the event against the hosts in the late match. Australia will take on Cuba the following day, with Canada and South Korea then going head-to-head. The group stage is scheduled to conclude on November 8 when Australia play Canada and Cuba take on South Korea. "With the full opening round schedule now revealed and two tickets to the Tokyo 2020 Olympics on the line, the stage is set for one of the most important international baseball competitions ever and one of the top major international sporting events of the year," said Riccardo Fraccari, WBSC President. The press conference took place three days after the Group A and B schedules were revealed in Chinese Taipei. Group A is being contested in Guadalajara, while Group B is being held in Chinese Taipei. United States, the Netherlands, Dominican Republic and hosts Mexico will contest Group A between November 2 and 6. World number one Japan face Chinese Taipei, Venezuela and Puerto Rico in Group B. The top two teams from each group will advance to Japan to compete in the super round from November 11 to 16. The super round will be staged at the Tokyo Dome and Chiba's ZOZO Marine Stadium. The final and bronze medal matches will be played at the Tokyo Dome on November 17. The two finalists will qualify for Tokyo 2020. Baseball is returning to the Olympic programme for the first time since Beijing 2008. Fraccari had revealed the Group C schedule with Chung Un-Chan, commissioner of the Korea Baseball Organisation. South Korean national baseball team manager Kyung-moon Kim and the Korean Baseball Softball Association (KBSA) President Euong-yong Kim were also present in Seoul. WBSC confirmed the appointment of South Korean baseball legend Seung-Yuop Lee, a Beijing 2008 gold medallist, as an ambassador for Group C.
"It's a great honour to have one of the greatest Korean baseball players of all time serve as an ambassador of the 2019 WBSC Premier12," said Fraccari. "Lee is an admired international baseball hero and will play an important role not only in the promotion of this global competition, but also the inspiration of the event and playing for your country."